The plan has always been to tear the kitchen down to the studs and rebuild the kitchen from scratch. 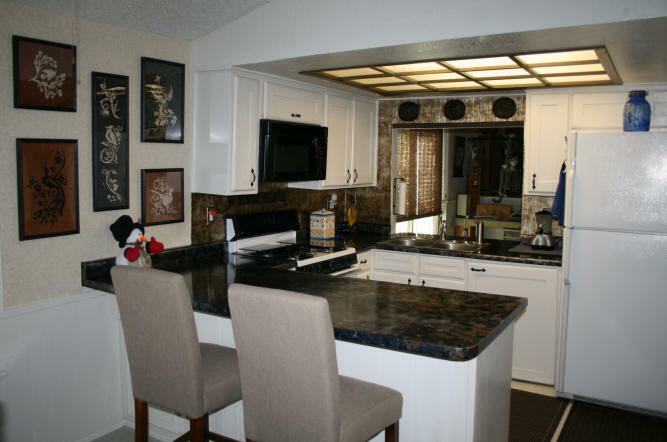 This would include a new layout, new drywall, new cupboards, new appliances, etc. This would of course run into the thousands of dollars, even if I did most of the work myself. I keep hoping to run into the folks from DIY's "Kitchen Crashers" at Lowe's or The Home Depot, where I will get down on my knees and cry, "Yes, please tear out my kitchen and break down as many walls as you need!!!" But the chances of them ever coming to El Paso, are like me winning a $25,000 jackpot. A slim chance to none.. So while I have dreams of a beautiful kitchen, the reality is.....this will not happen anytime soon. In the meantime, I can do a little with it to make it look better. 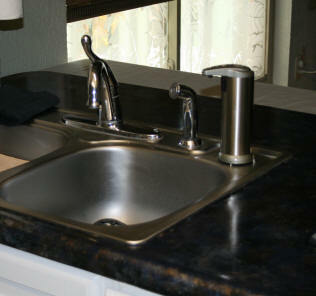 The first item I planned on working on were the countertops. For each of the main kitchen projects, I have created separate web pages for them in case you are interested in only that particular project. Before working on the counters I needed to do some general repair work to the walls above the elevation of the counters. 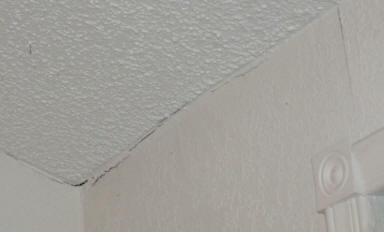 The drywall had some large cracks to fill and the seam at the top of the wall which met with the popcorn ceiling had some areas where the paint had cracked. 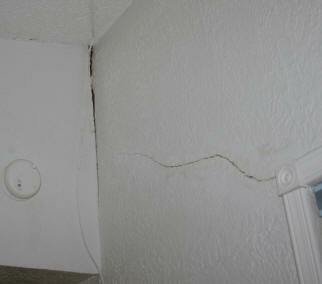 This happened when the roof was being trampled upon during the Raising the Roof Project earlier this year. 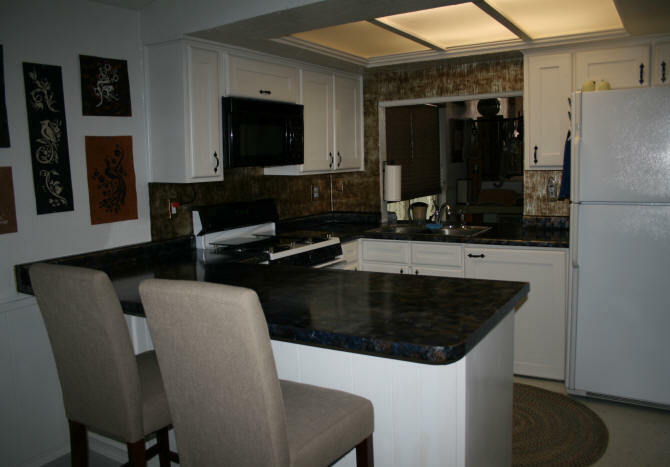 There was also a large gap above the cabinets over the refrigerator that needed to be fixed. 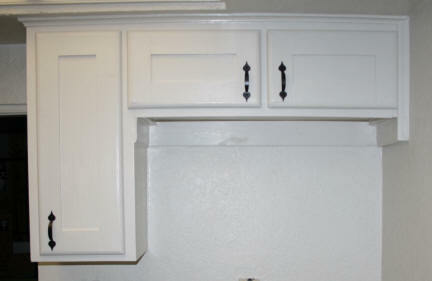 I needed to fix the dropping cabinet and reposition the moulding at the top of the cabinet. When we had moved into the house, our new refrigerator was too tall for the space so we busted out the bottom of the cabinet. We covered the old shelf gap with some moulding. This moulding looked silly now so I worked on that also. 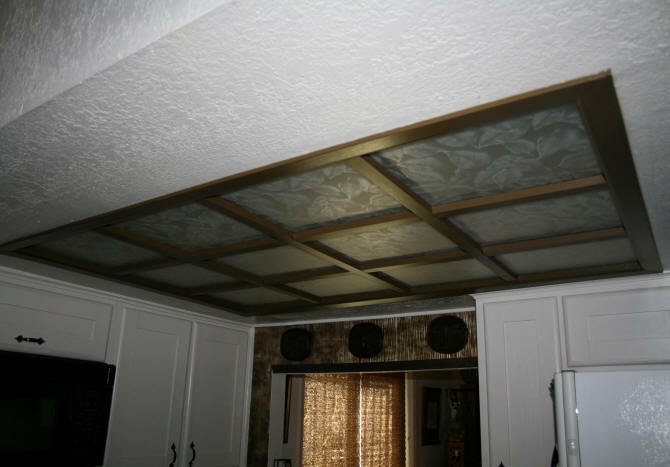 I removed the moulding at the top. Pushed up the cabinet as much as I could and secured it. Took off the cabinet doors and fixed them. Gave the handles a fresh coat of paint along with the doors. After cleaning off the moulding that went on the top, I reattached it to the top of the cabinet against the ceiling. 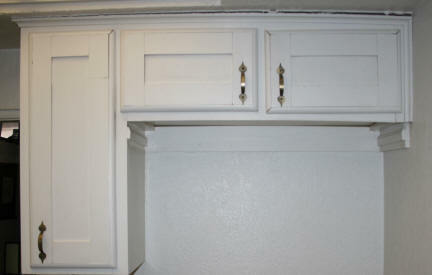 I re-did the moulding underneath the cabinet to the right and left of where the refrigerator goes. Then painted the whole area. 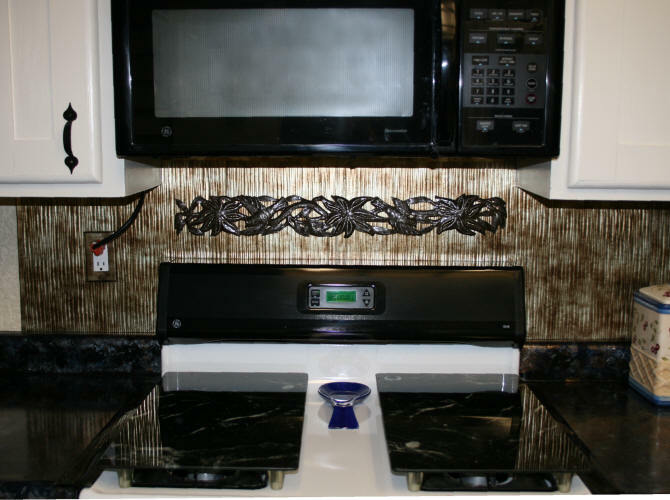 The next thing I wanted to work on was a backsplash. While I was waiting for those materials to come in, I repaired the lower cabinet doors where needed, painted the handles, and gave the cupboards a fresh coat of paint. The huge wall area next to where I decided to stop the backsplash. It is just too......I don't know...white? stark?... next to the newly painted counter and backsplash. I had already created some art pieces for the wall that needed to be framed. 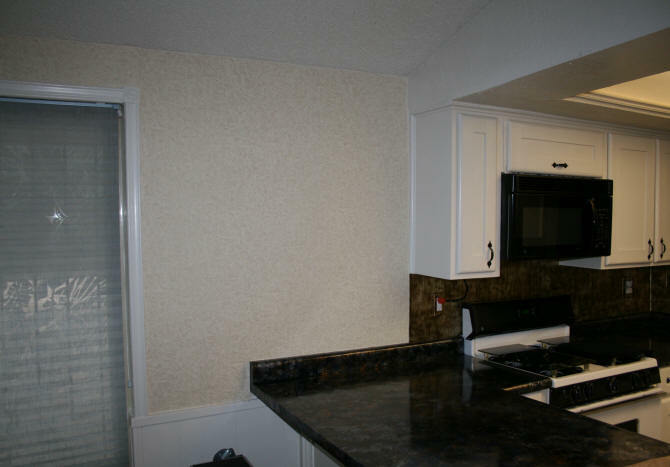 In the meantime, I decided to use some of the left over Corsica wallpaper that I used in my Master Bath (see this here...) The off-white and gold color in the textured wallpaper would work nicely with the newer color scheme in the kitchen and soften the look of this bright wall. 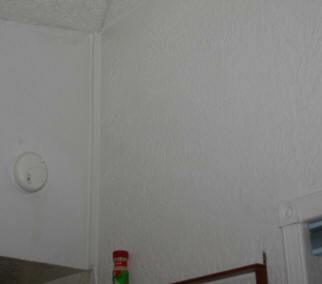 I could also cover-up the stupid hole in the wall, where there used to be a phone jack. Wall to add some wallpaper to. Also needed to cover phone jack hole. Wallpaper on. No more phone jack hole. 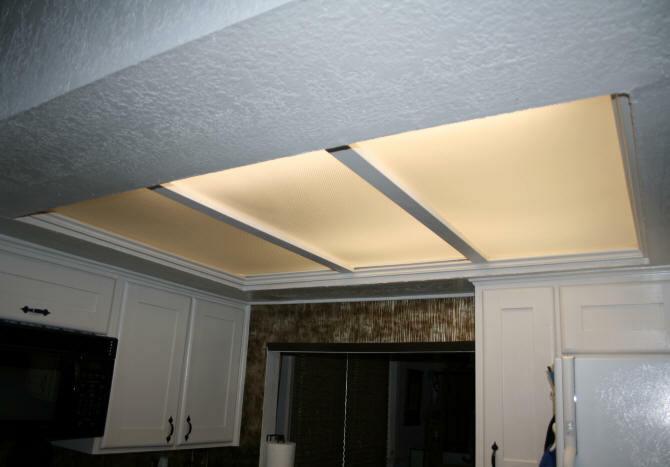 The next area of the kitchen that I worked on was the light area above the kitchen. In retrospect, I should have done this before the counters but I did not come up with the idea until later. In addition to the physical work that was completed in the kitchen, I bought a few items to complete the look. I had some old braided rugs on the kitchen floor previously. These rugs had moved around the house for over 10 years and were faded and in pretty bad shape. They were tossed. To replace them, I purchased some rugs that are technically outdoor rugs. They are lightweight and can be hosed down to clean them. With the dogs, it is necessary to be able to hose a mess down if needed. At the time I made my rug purchase they had a $75 off a $200 purchase sale. The three rugs I purchased totaled $195. Is this not always the case? So I needed to look for something else I wanted, to bring the sale up to $200. 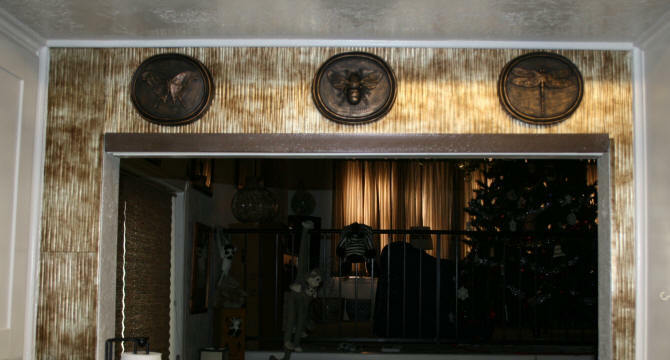 They had some Insect Plaques on sale for $26. So I ordered those also. 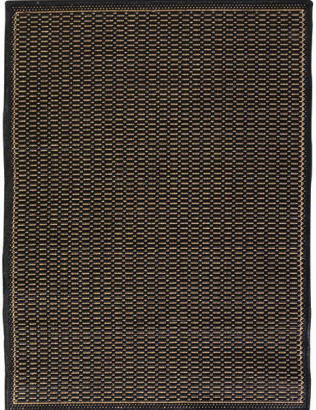 The style of rug I ordered was the Saddlestitch All Weather Rugs - Black. 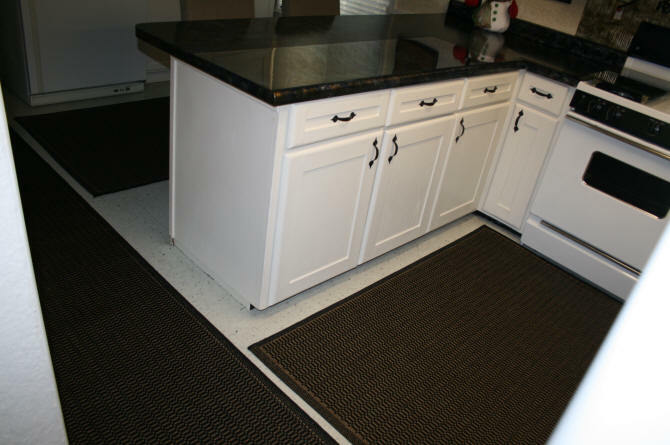 I ordered one 2'3" x 11'9" runner and two 3'9" x 5'5" area rugs to fit in the space on the kitchen floor. New rugs on kitchen floor. Because of odd kitchen layout, this was the only angle where I could photograph all three rugs in one shot. 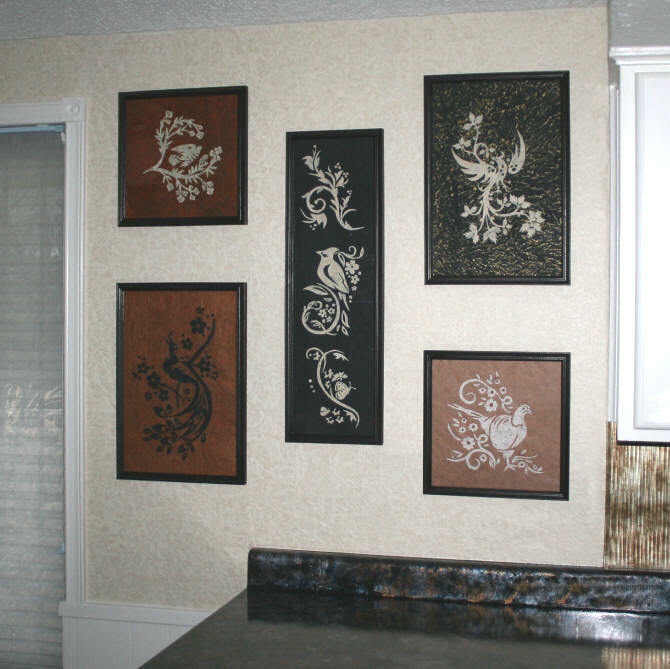 I purchased some Haitian Steel Drum Art originally to go above the kitchen sink, but the item was smaller than what was specified and looked too small over the sink, so I placed it on the wall behind the stove. The actual dimensions of the artwork are 28 1/4" x 3 1/2" not 30" x 4" as stated on the website. The one thing I noticed in my photos of the kitchen, was the ever present bottle of Dawn dishwashing detergent. This bottle represents a small household feud. My husband likes to close the cap after use. I on the other hand, like to leave it open for quick dispensing. I have also torn the snap cap part off in the past and thrown it away to keep it from being closed. I use this soap for hand washing and the dishes. Yes, my hands get that dirty. The solution to all of this fighting over a silly bottle and the tacky look of it always sitting on the sink, was to replace it with an automatic soap dispenser. I don't know why I did not think of this before!! 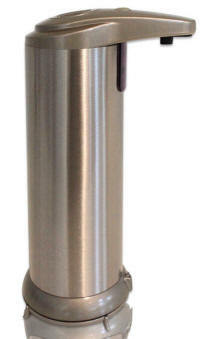 I purchased the Spruce and Chic® Automatic Touchless Soap Dispenser - Sensor Pump. This little battery operated wonder dispenses the right amount of soap without having to touch it. It matches the sink. No more tacky plastic bottle. No more opening and closing cap. 4 AAA batteries keep in running for about a year. While moving the stove in and out to work on the counter tops I was reminded about the gaps where all kinds of gunk gets stuck between the stove and counter. The one thing I wondered about, when looking for a solution to this, was whether it would work for my stove. The gap on the right side of the stove is tight. The stove rests right against the edge. 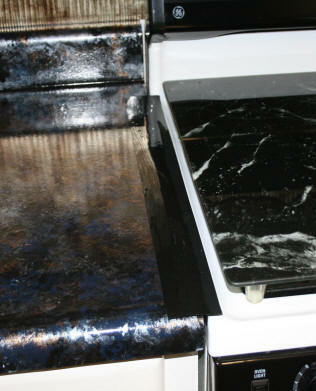 Also, because the floor is not level, the left side of the counter is level with the stove. 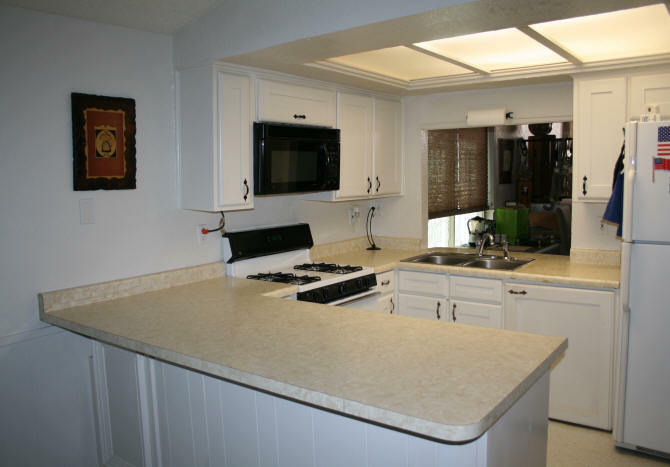 On the right side, the stove is slightly above the edge of the counter top. 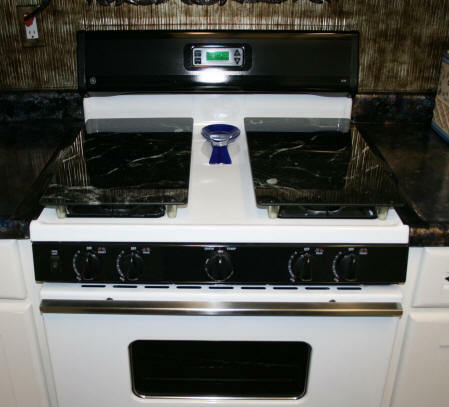 The gap fillers I found that work great are the McClure's Flexible Silicone Stove Gap Seals. I ordered the black. The gap fillers were exactly the right length for my stove. On the right side, I had to push the stove to the left to get the gap filler lip inside this tight gap. The seals only overlap the edge of the stove by about a 1/2" so I don't have to worry about them catching fire from the gas flame. 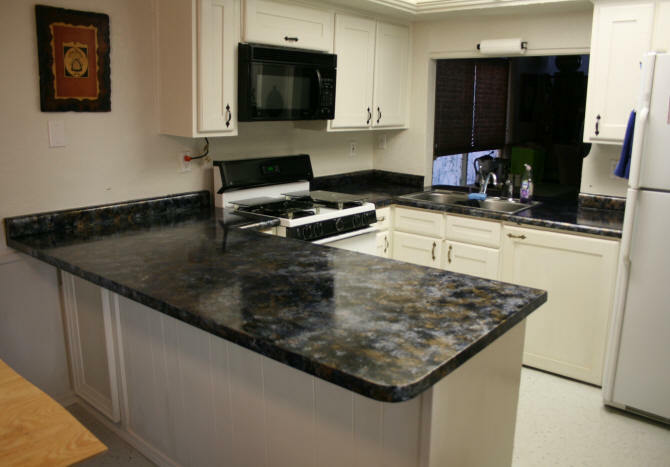 The black blends in with the new countertop color which makes them barely noticeable. They wipe clean easily with a microfiber sponge. 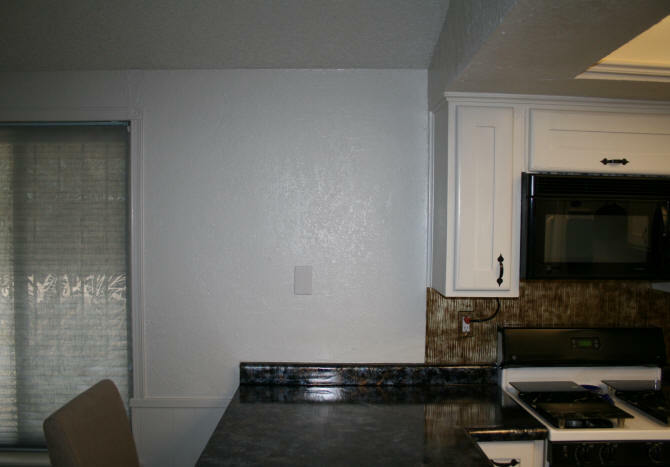 The photograph of the "new" kitchen after I finished the light fixture is below. I am now happy with the look of the kitchen until I get around to tearing it all out. Wow, I may even start cooking! !